A delicious and easy way to enjoy fresh trout whether on a camping trip or barbecue! 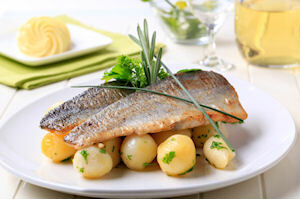 Tender trout is steamed in a packet with aromatic white wine, melted butter and zesty lemon juice for an incredibly tender and delicious way to enjoy the fresh fish. Serve with roasted vegetables such as grilled zucchini and potatoes, for a truly gourmet meal any time. Lay out two large sheets of aluminum foil, approximately 18 inches long so that they overlap. Lay fish in center of foil, approximately 2 inches apart. Sprinkle with white wine, melted butter and lemon juice and season with parsley, salt and pepper. Fold foil around fish, and crimp the seams to seal. Place the packet on the grill and cook for 15 to 20 minutes, or until fish is cooked through. Serve hot. I added peppers and onions to it and left it on for close to 30 minutes. The fish was so great it just slid off the bone.